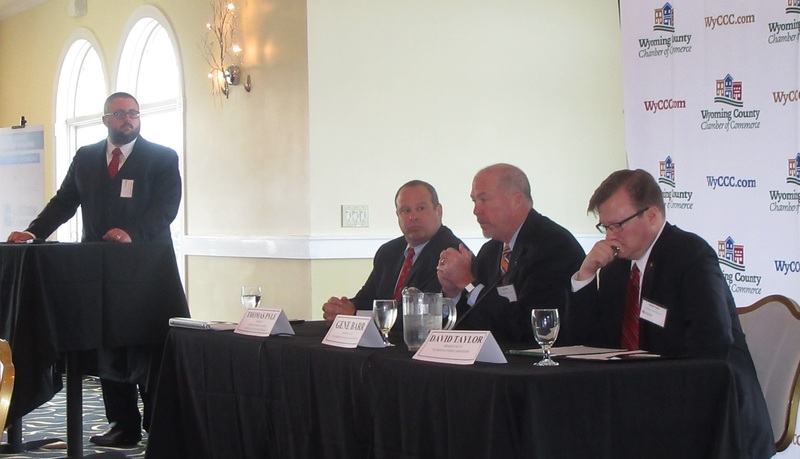 Bill desRosiers (above, left) of Cabot Oil & Gas facilitated Think About Energy, a panel discussion about the future of the production of natural gas and other energy sources in Pennsylvania, at Stonehedge Country Club on June 21. Panel members included (continuing from left) Thomas Pyle, Gene Barr, and David Taylor. 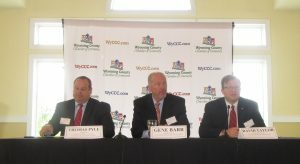 The event attracted more than 120 local business leaders (top) representing four regional cambers of commerce. 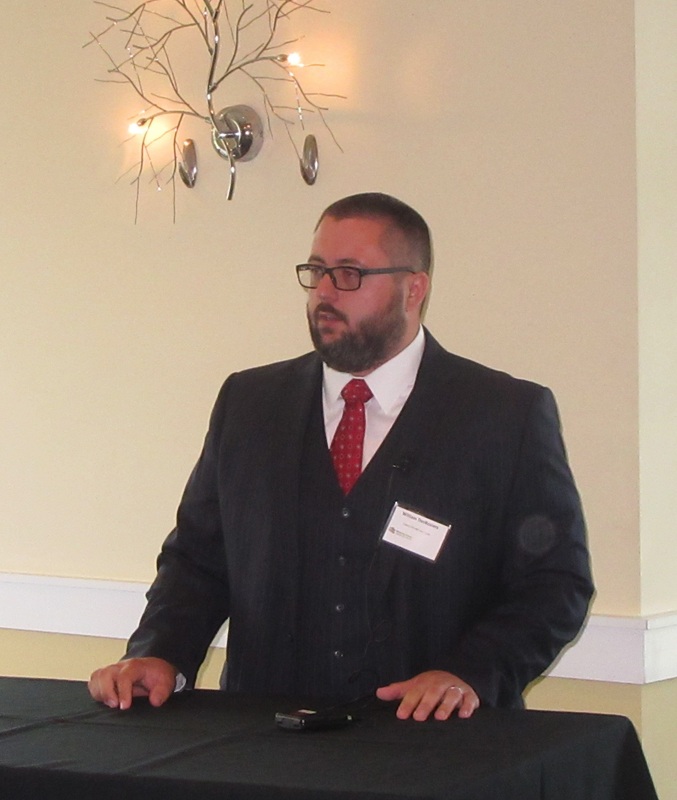 Three energy experts with varying perspectives on how to best move the natural gas industry forward in Pennsylvania and the nation spoke to a packed house at Stonehedge Country Club in Wyoming County on June 21. 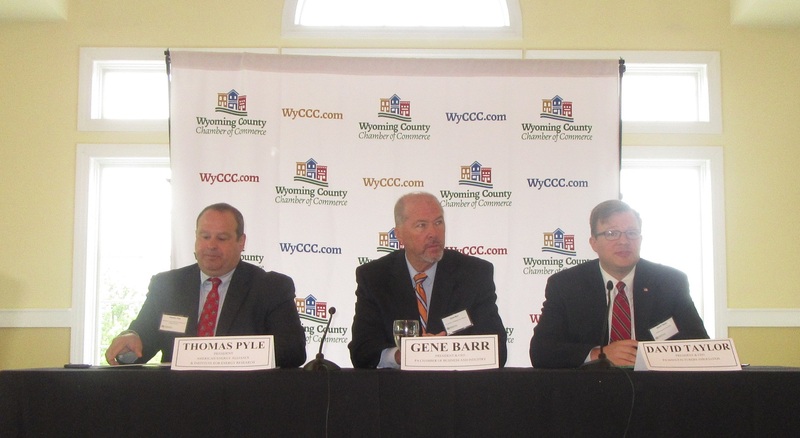 The Think About Energy conference was hosted by the Wyoming County Chamber of Commerce in partnership with the Back Mountain, Greater Wilkes-Barre and Greater Scranton chambers. Recurring themes during the two-hour event included the fact that energy production impacts everyone everyday, the sentiment that the public and politicians need a refresher course in the value and the value-added of energy production, and that what is happening in energy in Pennsylvania right now affects the country and the world more than ever before. They called on those living in energy producing counties to help them tell the story of how natural gas production has positively transformed the region. “It’s easier to explain it here where people can see it,” desRosiers agreed, noting that the concept is a harder sell in counties where there is no energy production. Taylor cited resistance against infrastructure development across the Commonwealth and threats of new taxes for preventing the rest of the state from reaping the benefits. From a national perspective, American Energy Alliance & Institute for Energy Research president Thomas Pyle feels that the Trump administration has made some positive policy changes, including repealing regulations on extraction and the use of fossil fuels that were imposed by previous administrations. Panel members agreed that they face stiff competition every day from environmental lobbyists, whom they contend are using money from peculiar sources to fund a campaign of disinformation that leads to economic illiteracy. They share a disappointment that New York and the New England states have wiped fossil fuels off their slate without an eye on the future. As a result of fighting the pipelines that would deliver natural gas, “in just a few years, their facilities will be unable to meet demand during cold weather,” Pyle explained. New England states have already resorted to purchasing gas from a Russian company operating in the Arctic Circle that was delivered under the French flag to avoid the sanctions placed on Russia, whom Pyle and Barr singled out as a key supporter of anti-fossil fuel campaigns in America. Chamber member Bill Kelly asked why the New England story isn’t better known. The same day as the conference, in fact, the PA PUC announced that $209 million in impact fees had been collected in 2017, nearly $45 million more than in 2016. The conference ended on a positive note, with each panelist offering his vision of the future of energy production. In addition to winning over the public and politicians to the benefits of responsible development, Taylor and Barr agreed on the importance of finding the proper balance between domestic use and exports.